The reality is that weed control simply isn’t what it used to be 10 to 20 years ago when it seemed that every new problem to spring up was quickly followed by a new, effective chemical solution. That’s not the case today anymore. It’s been almost 20 years since a new chemical mode of action (MoA) was brought to market and industry predictions are that it will be many more years before a new MoA is commercialized. In addition, the growing incidence of herbicide resistance is rendering some of the most relied upon herbicides less effective than they used to be. It means that growers need to be more creative with the herbicide tools they have now and use them in a way that not only gives them the weed control they need, but also manages weed resistance and extends the useful life of these tools. It provides an effective rotational ryegrass MoA for resistance management. Known as ARCADE® or BOXER GOLD® (when coformulated with S-Metalochlor) in Australia, prosulfocarb is a thiocarbamate herbicide that targets the meristematic region, or growing points, of plants – on both roots and shoots. Prosulfocarb’s MoA inhibits lipid synthesis in plant cells. In particular, it inhibits fatty acid elongase enzymes, altering cell membranes and disrupting vital cell processes. It also effects the development of cutin and suberin, two waxy polymers that help to form plant cuticles. The result is that meristems are inhibited, root and shoot development is stunted, new leaves fail to emerge and shoots twist and turn dark green. It is true that prosulfocarb has been in the market for a long time. First developed in the 1980s, it was commercialized in Europe in winter cereals in 1988 and in winter potatoes in 1991. It was something of a breakthrough at the time because unlike other thiocarbamates, it did not require rapid soil incorporation and could be applied as a early post emergent spray at lower rates. Then, as now, prosulfocarb is a workhorse product for producers looking for pre- or early post-emergence weed control in their cereals, pulses and potatoes: it is effective against a range of grass and broadleaf weeds, it can handle some difficult problems, (like herbicide-resistant weeds), it’s safe to the crop and it offers some residual activity for longer control. Prosulfocarb certainly took a back seat to newer weed control products as they came along. But as the problem of resistance to newer modes of action grows, prosulfocarb is now proving its worth on a new front: resistance management. Weed resistance to many key Modes of Action is rising dramatically. While growers understand the need to rotate and mix MoAs in order to slow the spread of resistance, their choices continue to narrow and weeds continue to adapt. In Australia the rise of Treflan (or Group D) resistant annual ryegrass signaled the return to action for prosulfocarb. 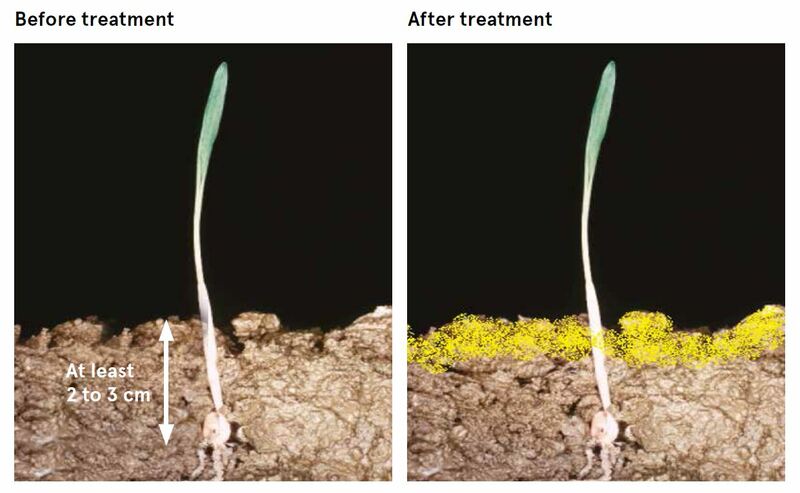 With no cross resistance between Group J and Group D herbicides prosulforcarb plans a crucial role in allowing growers to effectively control annual ryegrass while not relying on group D herbicides. For those growers who currently don’t have group D resistant ryegrass, prosulforcarb provides a rotational tool or a robust mix partners to reduce the speed of ryegrass resistance development. Syngenta is a strong promoter of EWM as an important strategy to help growers achieve better weed control and sees prosulfocarb as an effective tool in this practice. Why? Because prosulfocarb is built solely for effective early weed management in winter crops. Eliminating weeds as early as possible leads to better overall resistance management, which extends the usefulness of all MoAs. Moreover, eliminating weed competition as early as possible helps to ensure crops reach their full potential. When applied pre-emergence, prosulfocarb is taken up by predominantly by the base of the coleoptile (mesocotyl) and roots and is quickly transported though the xylem to meristematic regions, largely preventing seedling emergence. If seedlings do emerge, they die quickly afterward. Applied early post-emergence (up to the two-leaf stage), the AI is still primarily absorbed predominantly by the mesocotyl with some limited foliar uptake. Therefore for effective early post emergent activity prosulforcarb needs to be applied to moist soil and preferably have further incorporation through rainfall or irrigation. Again, the product then moves quickly to the growing points to kill the plant. Cereals plants are not affected by prosulfocarb because the seeds are sown below the main region of the soil where the herbicide resides after application. As cereal seedlings grow up through this layer, the lack of uptake into the shoot tissue prevents injury from occurring. This is known as positional selectivity. By contrast, most susceptible weeds are germinating in the top 1-2 cm of soil where enough prosulfocarb is found to be taken up and be killed. When you think about it, prosulfocarb has been an effective EWM tool for years and it will be for years to come. Indeed – from the outset, prosulfocarb has always managed to be the right tool for the times. No matter how weed management strategies have had to change and adjust over the last few decades, prosulfocarb has had a fit, from introducing early post emergent application to cereal weed control to becoming an important resistance management tool. As the business of farming continues to change, prosulfocarb will continue to deliver the same consistent performance it always has and help growers farm better.